the part of the hand between the wrist and fingers, its skeleton being five bones (metacarpals) extending from the carpus to the phalanges. See appendix 3-3. The five bones of the hand between the carpus and the phalanges. /meta·car·pus/ (-kahr´pus) the part of the hand between the wrist and fingers, its skeleton being five bones (metacarpals) extending from the carpus to the phalanges. 1. The part of the human hand that includes the five bones between the fingers and the wrist. 2. The corresponding part of the forefoot of a quadruped. the middle part of the hand, consisting of five slender bones, metacarpals I through V, numbered from the thumb side. 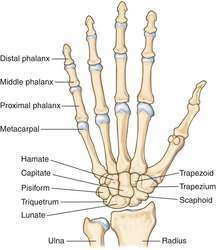 Each metacarpal consists of a body and two extremities. metacarpal, adj., n.
The region of the hand between the wrist and the phalanges, which includes the five metacarpal bones that support the palm/hand. The five bones of the palm of the hand. a bone of the forelimb of TETRAPODS that occurs between the wrist (CARPALS) and fingers (PHALANGES). In humans the metacarpus is in the hand. see PENTADACTYL LIMB. n the five bones of the hand between the carpus (wrist) and the phalanges (fingers). the segment of the limb housing the aggregate of metacarpal bones. The tables below present the data on the electrical parameters such as dielectric constant ([epsilon]'), dielectric loss ([epsilon]"), resistivity ([rgo]) and conductivity (K) of bovine femur, tibia, humerus, radius /ulna (fore arm), metacarpus, metatarsus, scapula, skull, pelvis, rib, and backbone taking 10 samples of each in wet / normal condition (table 1) and oven dried condition (table 2). Groups Control Vitamin E LPS Ossification site Metacarpus 3. Laverty fractured the third metacarpus on his left hand after crashing his Aprilia RSV4 and as a result has been unable to ride since. These values are lower than average values reported for the equine cortical bone, but similar to those documented in the trabecular bone of the equine third metacarpus (6093Mpa and 1174Mpa respectively) (VAN DE GRAAF, 2012). The right and left thoracic limbs were then separated from the animal's body, some soft tissues (cutaneous and muscular) and some bones (scapula, bones of the carpus and metacarpus, phalanges and sesamoid bones), while the parts consisting of the humerus, radius, ulna and the ligaments under study were maintained. 1%) cases, the dogs had more than one fracture: fracture of the pelvis and femur (n=51); fracture of the femur and the tibia and fibula (n=12); fracture of the pelvis, tibia and fibula (n=8); fracture of the pelvis, femur and tibia and fibula (n=6); femoral fracture and radius and ulna (n=6); radius and ulna fractures and metacarpus (n=2); fracture of the tibia and fibula and the radius and ulna (n=1), and fracture of the humerus and the radius and ulna fractures (n=1). In one heifer with metaphyseal fracture of metacarpus, callous formation and fracture healing could not be observed even after two months as skin loss was very extensive, fracture was very near to the proximal growth plate and only one pin could be passed in proximal fragment. The bird had started self-traumatizing approximately 1 month after fracturing the right metacarpus, although the fracture had stabilized, surface wounds had healed completely, and treatment with a nonsteroidal antiinflammatory drug had been administered. The head was separated from the carcass at the atlanto-occipital joint; forelegs were split by cutting between the carpus and metacarpus, and the hind legs cut between the tarsus and metatarsus. Angiography of equine metacarpus and phalanges: Alterations with medial palmar artery and medial palmar digital artery ligation. 25MHz ultrasound velocity and bone mineral density measurements in the equine metacarpus and their in vivo applications.